The 90 mile Dorset Jubilee Trail was established to celebrate the 60th anniversary of the founding of the Ramblers' and was opened in 1995. 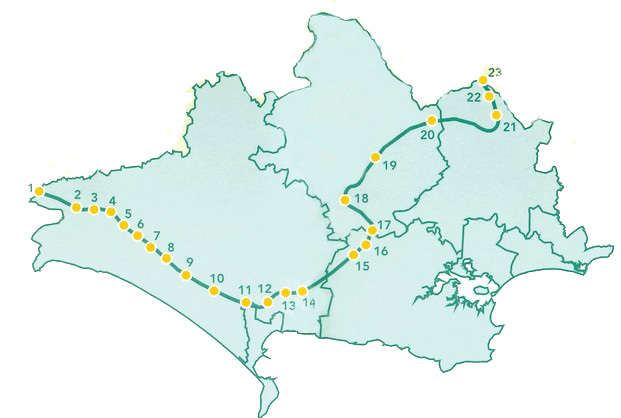 The route was compiled and surveyed by members of the Ramblers Dorset Area with the co-operation of the county and parish councils, landowners and farmers. The Jubilee Trail runs from Forde Abbey on the Somerset border in the west, across Dorset to Bokerley Dyke in the north-east on the Hampshire Border. It avoids existing trails and popular rights of way and seeks out little known paths in order to open them up for all to enjoy. The Trail winds through quiet villages, passes rural churches and offers extensive views over the rolling downs and secret valleys that make Dorset so special. To celebrate the Jubilee Trail's 10th Birthday on 25th September 2005 the Dorset Rambler's groups organised a number of walks along the route. Participants had the opportunity to inspect some of the new gates that had been installed at Winterborne Stickland, replacing stiles. Further new gates, signposts and way mark posts have also been erected on other parts of the route. All these improvements are jointly funded by Dorset Ramblers and Dorset County Council . The council's works team have also been responsible for all the installations for us so we are grateful for Dorset County Council's help and support. Further work should be forthcoming as our funds allow through profits from sales of the Jubilee Trail Guide Book. 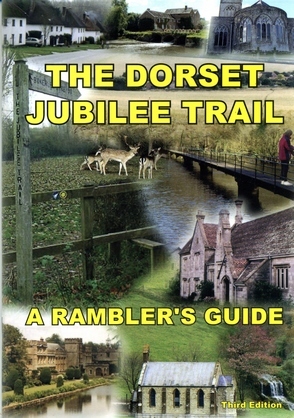 A comprehensively revised third edition of The Dorset Jubilee Trail - A Rambler’s Guide ISBN 978-1-906494-10-0 is now available. Dorset retailers and one online source who stock the guide. Alternatively the guide can be obtained from the Jubilee Trail Co-ordinator price £5.50 + £1.50 p&p.